The SheafferÂ® 100 Ballpoint Pen is sure to please. The brushed chrome finished set is handsome on a desk or in a purse and features brushed chrome caps and barrels with satin chrome trim. This timeless finish makes a powerful statement at school or on the job. 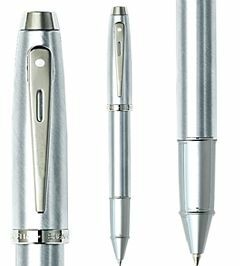 The ballpoint features a smooth twist-action mechanism that locks in position during use for firm, controlled writing and includes a SheafferÂ® ballpoint refill for extra-long write out. Affordably priced, the SheafferÂ® 100 Ballpoint Pen is an easy way to offer a gift with meaning, the "Gift of Fine Writing". The highlight of the pen is the SheafferÂ® signature wide band and the "White DotÂ®" symbol of quality. 1 x G/Boxed.